Home→Languages→English→Will They Ban Smoking In The Smoky Drinky Bar? ← Wird das Rauchen in der Smoky Drinky Bar verboten? Smoking bans have driven smokers to the margins of society. And as smoking bans extend to more and more places (e.g. parks, beaches), many smokers are increasingly confined to their own homes (where increasingly they are also being banned from smoking). But thanks to the internet, confinement to one’s own home may be opening up some rather astonishing new social opportunities. Internet social media platforms like Facebook and Twitter have already created new kinds of online communities. Facebook and Twitter are essentially text-based social media. But with the rapidly increasing use of fast broadband internet connections, another form of social media is emerging, where people speak face-to-face to one another using video and audio feeds from their computers or mobile phones. Last year I started the Smoky Drinky Bar using appear.in. 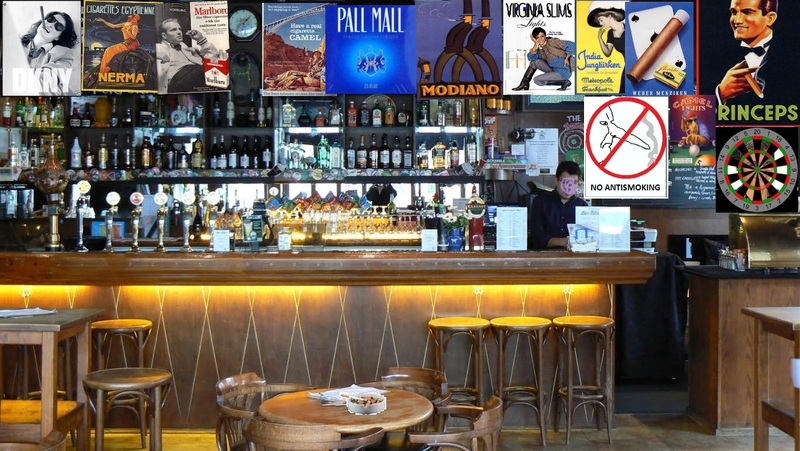 I got hold of a photo of the interior of a real bar, and decorated it with cigarette advertisemnts, and a dartboard, and a No Antismokers sign, and a few ashtrays, and invited readers of my blog to meet up there. Up to about 12 people can be accommodated in the bar at any one time. And it now has a small clientele of “regulars” who meet up there once or twice a week to swap news and gossip and jokes and music. A new community has been created. And it’s a community that is much like the pub communities that the smoking ban destroyed. You enter the Smoky Drinky Bar in the same way as you would enter a real bar: you just walk in. And as soon as you walk in, you are given a place alongside whoever happens to be in there, and you can then talk to them more or less as if you were in the same room as them, and sitting at the same table. Everyone can see everyone else’s faces, and hear everyone else’s voices. And the extraordinary thing is that the people entering the Smoky Drinky Bar can be, and often are, from almost anywhere in the world. And so the “regulars” in the Smoky Drinky Bar include people not just from Britain (where I live) but also Ireland and Scotland and Denmark and Greece and the United States and Australia and New Zealand. But we’ve also had visitors from Holland, Germany, Spain, and Russia. Of course in this particular case, the language being spoken is almost always English. But it could just as easily be (and sometimes is) another language. There are some problems with the different time zones around the world, because during the after-hours periods when most people meet up, some people on the far side of the world will be at work or asleep. And there are quite often technical problems. Broadband connections may slow or get broken, resulting in the break-up of images and sound. Feedback from microphones can also cause loudspeakers to howl. There are also elements missing from the new social medium which are found in the real thing. It’s not possible, in the Smoky Drinky Bar, to buy someone a drink, or light their cigarette. Nor is it possible to shake their hand or kiss their cheek. Nor is it possible to make eye contact with anyone. But there are also bonuses. It’s no longer necessary to dress in coats and hats and boots to meet people. Nor is it necessary to catch a bus or a train to go to a bar, or to come back from it. Nor is there any closing time when you will be evicted from the Smoky Drinky Bar. Nor is there any need to worry about being over the limit if you’re driving home afterwards. I’m sure that similar little bars will soon start cropping up everywhere. They won’t just be of value to isolated smokers. They’ll be of value to housebound elderly people or invalids. They’ll be of value of anyone who wants to hear a familiar voice, speaking their native language. It won’t be for everyone, of course. In many ways public bars and restaurants are for people who can’t afford to entertain at home. If you’re a rich smoker who always entertains guests in a palatial villa, public smoking bans would not affect you at all. And if you have a house with a living room to which you can invite friends, public smoking bans may not affect you very much either. But if you fall outside these categories, for any one of any one of multiple different reasons, little chat rooms like the Smoky Drinky Bar might seem like a godsend. The connections created by the Smoky Drinky Bar have results in real life. Next week, for example, I will be visiting a sick Smoky Drinky Bar “regular”, in the company of a couple of others. We will all meet in real life for the first time ever. And in a couple of months a couple of other “regulars” will be coming to stay with me in my flat. I haven’t met them in real life either. But I know them all well already, from the hours we’ve spent together in the Smoky Drinky Bar. There are other possibilities as well. If people can talk to anyone in the world, then when Donald Trump goes to China to meet Xi Jinping, lots of other Americans can meet up with lots of Chinese people. Everyone will become an ambassador. And if everyone can meet anyone else, everyone will become a reporter Already increasing amounts of TV news are being provided by people with smartphone videos, because there are no TV cameras on site. And at least in the Smoky Drinky Bar, smoking is being re-normalised rather than de-normalised. 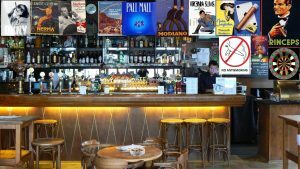 Which raises the question: Will Tobacco Control set out to ban smoking in online Smoky Drinky Bars? Perhaps one day I will find that all the cigarette adverts have gone, and been replaced by No Smoking signs? And the threat of 25th hand smoke (transmitted by WiFi) will be cited as the relevant Public Health threat. They will try and ban smoking in every venue they can. They are trying to ban smoking in films (and censoring historical images of smoking) in many nations (so far not the US where the First Amendment precludes that–for now). When they can’t get government to ban smoking on screen they seek corporate intervention (as in the case of Disney Company banning smoking in their films). In addition, they can try and block access to the ‘virtual’ spaces form the physical access points: for example, you can’t access an online forum from your home if you live in public housing due to recent bans, you can’t access online forms from internet cafes, pubs, or libraries as those indoor spaces have been deemed ‘smoke-free’. The totalitarians will seek their ‘smoke’ and ‘freedom-free’ utopia at all costs. Tobacco control must be destroyed!